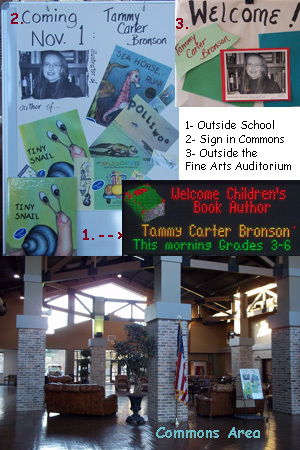 I was on the verge of posting about my first 2012 author visit when I realized I still needed to publish about my final visits in 2011. Here is an overview of my last trip to Atlanta, Georgia. I spoke to the children from the stage in the cafeteria. 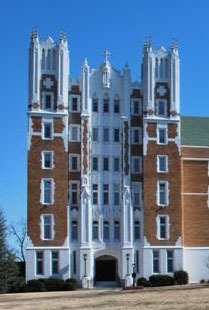 About 200 students attended each program. 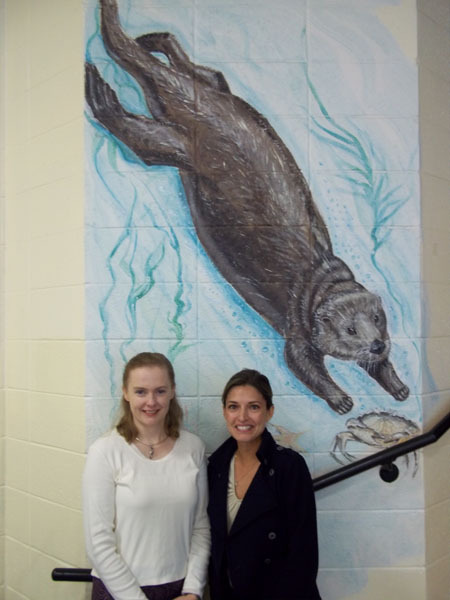 PTA member Jeannie Fisher (right) with Tammy (left) at Ocee Elementary, home of the otters! Each group had about 80 students. 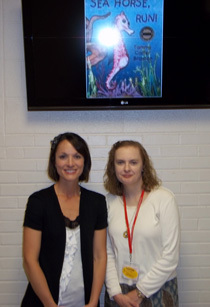 The librarian, Jennifer Rice (right), did a fabulous job preparing students for our visit. 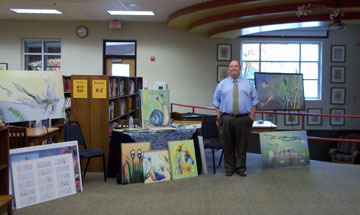 My husband and co-author of KALEIDONOTES in the GACS library. We were right at home in their lovely library. The librarians, Allison Anderson and Renee Arnold, were very excited about our visit. Their enthusiasm for our books prior to our arrival prepared the students who were fully engaged and asked great questions. 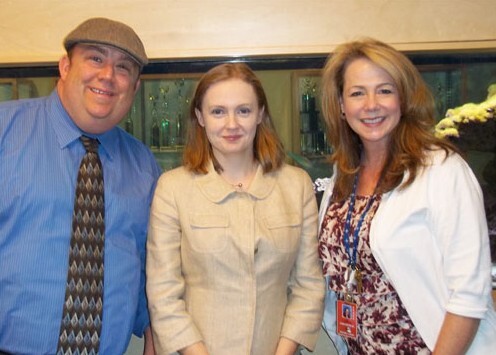 From left to right: Allison Anderson, Tammy Bronson, Renee Arnold. A 2nd grade teacher, Crystal Rush, taught in Conway, Arkansas before moving to Norcross. 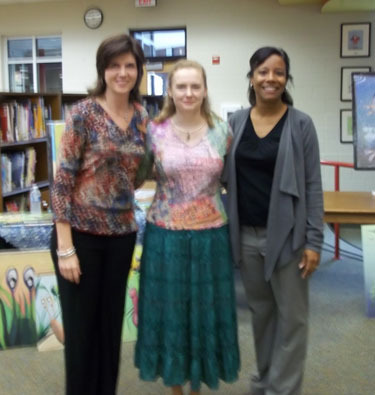 She fondly recalled my author visit to Marguerite Vann Elementary on March 5, 2010. It’s a small world! 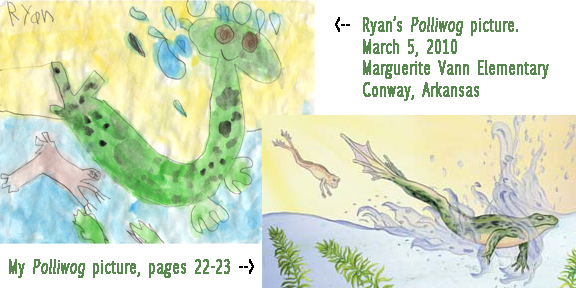 I remember my visit to that school because a kindergarten student sent me a watercolor painting he did from my Polliwog book. It was such an amazing picture, I framed it. It still hangs in my office. Responses like this encourage me to continue traveling and inspiring children to be readers, writers, and lifelong supporters of the library. I am grateful for any feedback, but this was a big boost that helped me get off on the right foot in the new year. A fond farewell to 2011. Hello, 2012! The students and staff at Liberty Christian School in Argyle, Texas gave me a warm welcome Tuesday morning, November 1st. My program was in the Fine Arts Auditorium where they had a giant screen that lowered in front of the stage. The librarian, Yvonne Lacy, provided a document camera so I could project images of my books on the screen for 3rd through 6th grades. Mrs. Lacy did a fantastic job preparing the students for my visit. Many of them were serious writers in their own right and very interested in the publication process. How many copies of Tiny Snail are in print? How many awards and honors have I received. 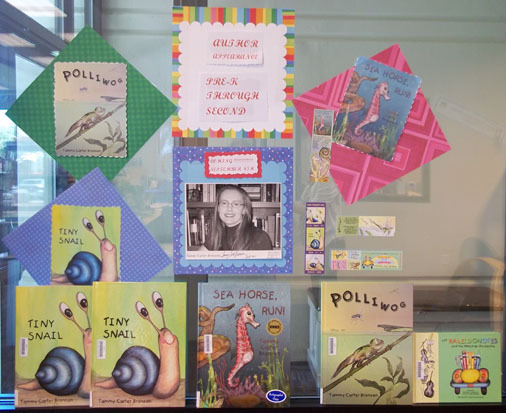 Answer: “Sea Horse, run!” has won two awards: 2011 Next Generation Indie Book Award for Best Picture Book, and it is a Finalist in the USA Best Book Awards in the picture book category. Three interesting facts about me. Who or what has influenced my writing. Answer: My fellow Arkansas author, Darcy Pattison. 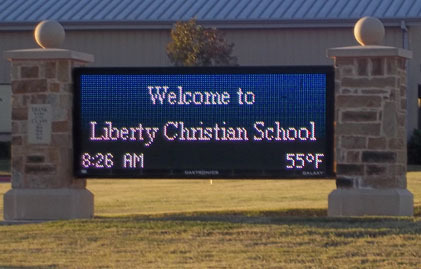 I was very impressed with the students, staff, and the amazing facilities at Liberty Christian. I thoroughly enjoyed the visit! 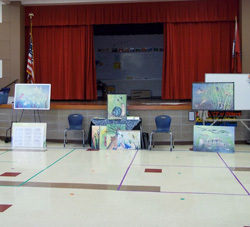 In April 2001 I visited Grace Hill Elementary in Rogers, Arkansas. 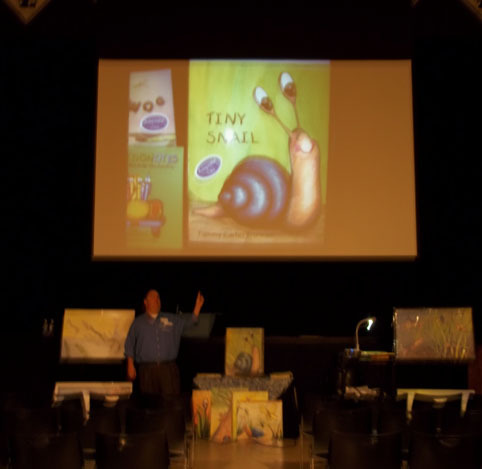 It was one of my first author visits, and at that time I only had one book, Tiny Snail. 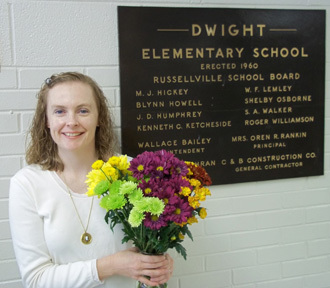 Katie Thomas, a former teacher at Grace Hill, is now the principal at Collegeville Elementary in Bryant, Arkansas. 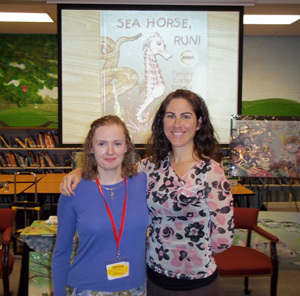 I was amazed to learn that ten years later Katie remembered my 2001 author visit at Grace Hill, and when it came time for her to select an author for a program at Collegeville, she chose me! My visit to Collegeville Elementary was Monday morning, October 24, 2011. Collegeville shared the day with Salem Elementary, and both school programs were in the gym. 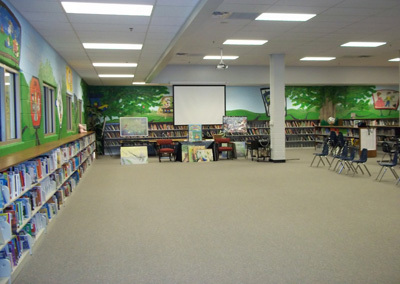 Since there were about 200 kids in each presentation, the schools provided a document camera so smaller visuals could be projected on the wall. Despite the size of the groups, students were very attentive and asked great questions. I am very grateful to both Katie Thomas and Salem’s principal, Mark Scarlett, for taking time out of their busy schedules to organize the author visit and to meet with me personally on the day of the event. It was a lively and very rewarding day. Students are welcome to keep in touch and send questions via e-mail at books@bookaroos.com. 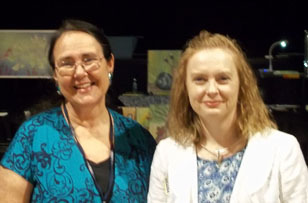 Lori Kirtley (left) is the librarian at Dwight Elementary. As a native of Arkansas, visiting an Arkansas school is a special treat. Yesterday I spoke to students at Dwight Elementary in Russellville, a beautiful Arkansas town nestled between the Ozark and Ouachita Mountains. With only 270 students (K-4), Dwight was a small school with a big heart! The students and staff were very enthusiastic, and the librarian, Lori Kirtley, did a fabulous job preparing all the students for my visit. 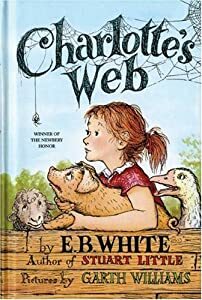 Every child was familiar with my stories, and in the hall outside the library a monitor flashed pictures and highlights from my books. The program took place in the cafeteria, and at the end of the day Lori gave me a lovely card and flowers. Hopefully I motivated more Arkansas students to pursue a career in writing and/or art. Thank you, Dwight Elementary, for inviting me to your school! On Tuesday (September 27th) I visitied Trip Elementary in the historic town of Grayson, about 30 miles northeast of downtown Atlanta, Georgia. 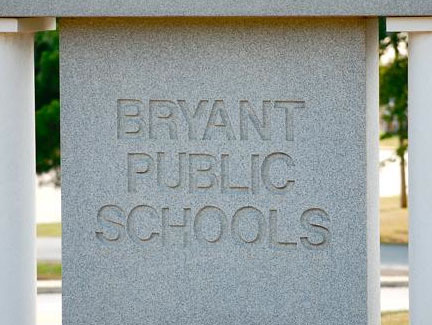 Grayson has six elementary schools, all a part of the Gwinnett County Public School system. 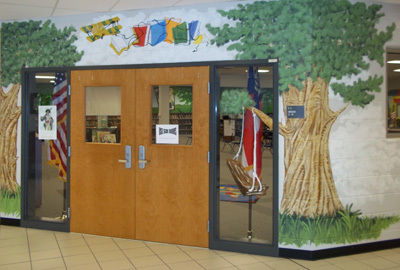 Trip Elementary has almost 850 students (K-5th), but even with an average of 140 students in each grade, the library was large enough to accommodate every group. Technology can be unreliable, so generally I use hand-held visuals (books, sample art, posters, etc.) when I talk to students. I rarely use multi-media in my programs, but the librarian, Nicole Dineen, set up a document camera so students in the back of the room could see the details of some of my smaller visuals. The document camera worked perfectly, and it allowed me, for first time at a school, to use my iPad with the 4th and 5th grade students. The document camera projected a few minutes of footage from my ribboned sea dragon video. 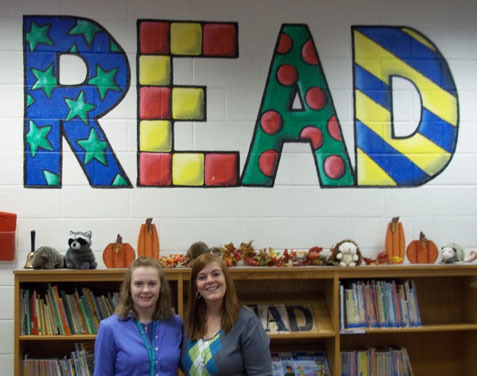 Tammy (Left) and Nicole Dineen, Librarian at Trip Elementary. Nicole did a great job organizing the visit. Many thanks to the students and staff for our warm welcome! After the visit I drove as far as Memphis where I spent the night in Marion, Arkansas. 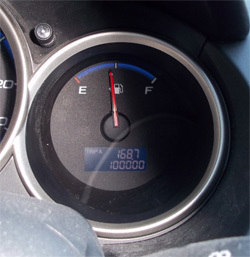 The next morning I drove the remaining distance home, and somewhere between Memphis and Little Rock my little Honda Fit reached a milestone: 100,000 miles! 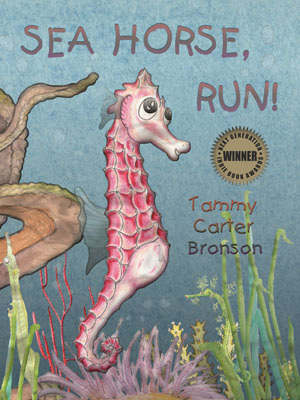 My first new book in 7 years, “Sea Horse, run!” (SHR), launched on June 1, 2011. As a children’s picture book, SHR was entered into 16 different awards. SHR won the 2011 Next Generation Indie Book Award. Seven fabulous reviews for SHR, the most reviews I’ve ever received for a single book! 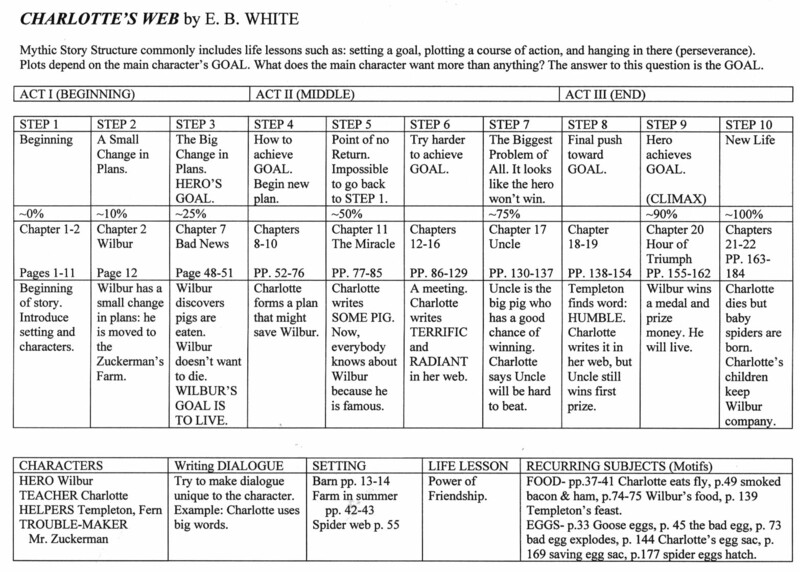 Several of the reviews were by major, national publications such as Kirkus and PW (Publisher’s Weekly). I finally joined TWITTER in July where I customized my page with a SHR theme. Follow me: @T_CarterBronson. SHR was featured in the July 2011 issue of Northwest Arkansas’ Citiscapes magazine, page 35. Three book signings in bookstores: Barnes & Noble Store#2662, Omaha, NE (Tues, May 17th); Barnes & Noble Store #2721, Fayetteville, AR (Sat July 9th); and Nightbird Books, Fayetteville, AR (Sat, August 6th). I learned that my original SHR website would soon disappear, so I started a Word Press Blog in July to replace it. SHR featured July 28th at DallasKidsRead!, a Dallas Children’s Literary Festival at the Dallas Public Library. Waterman Entertainment in Los Angeles requested a copy of SHR in August. SHR shipped to IBPA for display at the Frankfurt Book Fair. The softcover of SHR was released September 1, 2011. 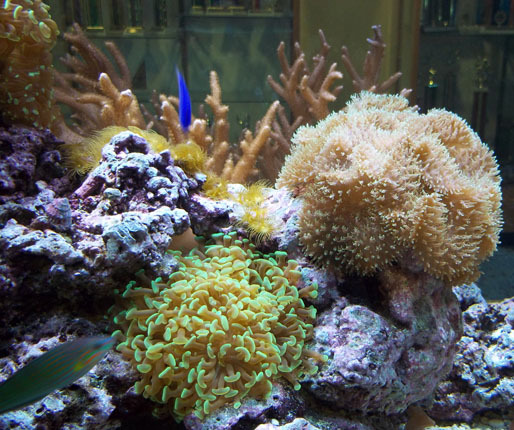 So far, five aquariums have ordered SHR for their gift shops. With all the attention for SHR, I almost forgot my backlist, but out of the blue, a Barnes & Noble store in Lone Tree, Colorado ordered 25 hardcover copies of Polliwog (2004). Go, Polliwog, go! Mariposa Press agreed to represent all of my books for distribution in France! A distributor of English language books in Taiwan, Chang Yi Cultural Company, ordered SHR, Tiny Snail, & Polliwog. In addition to carrying SHR in their gift shop, the Columbus Zoo & Aquarium ordered copies of Tiny Snail. Crystal Bridges Museum of American Art ordered Tiny Snail, Polliwog and Kaleidonotes for their gift shop. Five conferences: SCBWI Midwinter Conference & Art Showcase (New York City, NY; January 28), Illinois Reading Council (IRC in Springfield, IL; March 17-18), Texas Library Association (TLA in Austin, TX; April 12-15), Arkansas SCBWI Spring Conference (North Little Rock, AR; April 29-30), Tulsa OK Play conference (Tulsa, OK; June 18-19). Two library talks: Dallas Public Library event (July 28th) and Fayetteville Public Library event (September 24th). Thirty-two author visits (January-September 8, 2011 at Good Shepherd Episcopal School). For a total of 42 public appearances so far this year. In the last ten years, the average number of public appearances I make in a year is around 55. Yes, over fifty appearances each year! I have 21 more school visits booked for the fall which brings my 2011 total to sixty-three appearances. Where did all the time go? Traveling, filling book orders, building 2 new websites/blogs, not to mention mailing packets of books for schools, reviewers, and book awards. It’s no wonder I never found time to revise and submit my novel for possible publication or turn my picture books into e-books. Those “little” projects are now scheduled for completion in the coming months in between the 21 author visits that will take place in 7 different states. I have a feeling there will be more book adventures, announcements, and news in Fall 2011!